First announced in the spring of 1983 as "Project Apricot", from Birmingham-based ACT, the original Apricot was first unveiled to the public at the 6th P‌CW Show - which ran from 29th September to 2nd October 1983 and was staged at London's Barbican Centre - where it was billed (by Personal Computer World) as "the tastiest silicon cocktail for some time". There was something of a surprise at the launch in the form of a cake "modelled to look just like ACT's new piece of leading-edge technology" which included a separate screen and keyboard, also in the form of cake. Incorporating either one or two Sony 3.5" 315K floppies, high-resolution 800x400-pixel graphics and a true 16-bit 8086 processor running at 5MHz, the 23lbs (10.4kg) Apricot was billed as a "transportable", rather than the more optimistic "portable" which even-heavier machines like the Osborne 1 claimed. It had been co-designed with external agency QED and was probably the first (and one of only a few) machines launched with ACT Sirius 1/Victor 9000 compatibility as a headline feature, rather than the increasingly-dominant IBM PC format. The IBM PC, despite being launched in the US in 1981, didn't officially make it to the UK until the beginning of 1983 and for a while the Sirius - designed by 6502 and Commodore PET designer Chuck Peddle - was in the lead. The name Apricot was a roughly-fitted "pretend-onym" derived from the company's full name - APplIed COmputer Techniques. ACT, a Dudley-based company with various interests from supplying computer stationery to being a software house, had been importing the Victor 9000 and reselling it as the Sirius 1. As the company moved in to manufacturing its own machine, it set up a factory in Scotland which was capable of building one Apricot computer every minute. It made use of its Victor connections in order to sell in to the US, which was perhaps a brave move given the IBM's dominance over the pond. ACT also had an agreement with Victor which enabled the latter to also build the Apricot in the US (and vice-versa) if necessary. The Apricot's keyboard was slightly unusual. Connected to the main machine with a serial link, the keyboard contained a feature called "Microscreen" - a two-line, 40-character LCD, which at start-up showed the date and time but which could also switch in to being a calculator (without having to run any software) or which could show dynamic labels for the fully-programmable touch-sensitive function keys next to it - much like the soft keys of a modern smartphone keyboard. The machine also came with a £750-worth of bundled software (£2,520 in 2019), including no fewer than three operating systems: MS-DOS 2, CP/M-86 and Concurrent CP/M-86. 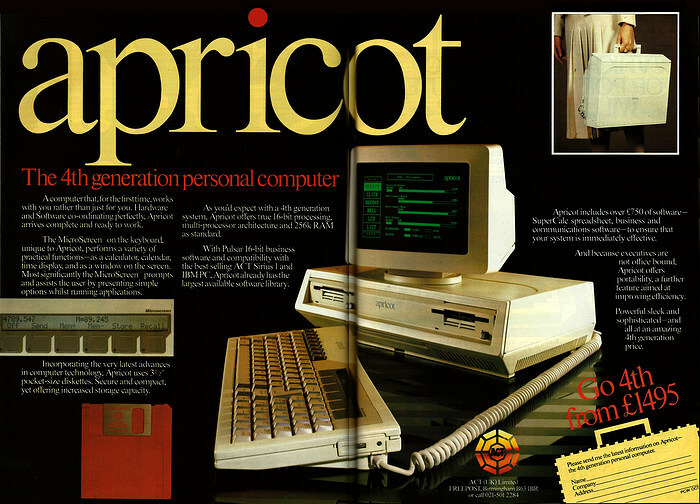 Reviewed in October 1983's Personal Computer World, the Apricot came out very well, with Peter Rodwell summing up that it was a machine "precisely and expertly designed for the modern micro market; it incorporates no barely-tried leading-edge technology, just careful, clever and well-proven software and hardware techniques and a good deal of original thinking. And it provides these at a price which is going to cause a few people something of a shock". It retailed for £1,495 + VAT, or about £5,780 in 2019.